Even the protozoa in our drinking water are, under the microscope, delicately lovely, and when increased in size to the dimensions of a grapefruit, might, with distinction, grace a Christmas tree. Shocking though they are, such models are intended to be revealing rather than sensational. Their primary function is to show to many people what the scientist sees beneath his lenses, the bizarre beauty, the sinister efficiency, the infinite variety of the lesser animals with which this world abounds. In the American Museum of Natural History, in New York, there are some wonder-fid models of this kind, most of which I have known personally all my life. As a child I haunted the Museum, staring in fascination at the giant insects, the huge shell-fish and the mammoth animalcules, half thinking them alive. Somewhat later I began to wonder who had made them, and how it had been done. In the nine years that I have worked in the Museum many of my early friends have come under my hands for cleaning or repair. What I have learned about them only increases my admiration and envy. My respect for the craftsmen who made them is profound. The construction of accurate enlarged models of biological subjects is at once an art and a science. It requires a knowledge of anatomy, plus skill, ingenuity, and patience—particularly patience. I have been told that B. E. Dahlgren labored lovingly for several years over the great Malarial Mosquito which dominates Darwin Hall, and I believe it. My own first insect model occupied the working hours of six months, though it was, by comparison, a small and very simple one. When I came to the Department of Insects and Spiders at the American Museum, fresh out of the Department of Entomology at Cornell University, I had never made an insect model in my life. But I knew at least the elements of insect anatomy. 1 had been brought up with tools, and had learned from books the rudiments of half a dozen crafts. I saw no reason why I could not make a model, and rashly said so. Scarcely a year later I was called upon IO prove my words. The late Dr. F. E. Lutz, then head of the department, presented me with half a pint of pickled Mole Crickets, including a few live ones, and requested that I make him a model, five times life size, to demonstrate the adaptation of these insects to their subterranean habitat. A Mole Cricket is about two inches long, heavy and simple in structure, and almost free of spines, it was really a very easy assignment, though it looked hard enough to me then, I can assure you. When confronted by a problem about which you know nothing, it is well to seek experienced advice. I consulted the Preparation Department of the Museum in the person of Mr. Albert Butler, and whatever proficiency I have attained is due in great measure to the generosity of his assistance. No two of the magnified models in the Museum have been made in exactly the same way. Each subject presents its own problems, to be solved by each artist according to his experience, and skill. The insect models. which engage my chief interest, have been made by several people. The craftsmanship is perfectly distinctive, but the underlying technique of all appears to be the same kind of wax work as that which Mr. Butler taught to me. The essence of this system can be expressed in a very few words: Build it up and whittle it down. In practice, it is considerably more complicated. A thorough study of the subject, living and dead, precedes the making of every model. If it is impractical to keep a specimen alive throughout the course of the work, action sketches are made while possible, and the colors of life, so often fugitive. are noted carefully. A preserved specimen is drawn accurately to scale, top, bottom, side view, and both ends, with the appendages and some other details figured separately. The use of squared paper and a low-power microscope with an eyepiece micrometer which squares off the field of vision will greatly facilitate the making of these drawings upon which depend the size and accuracy of all the later work. Just in case someone is thinking of following these directions, I hereby issue a solemn warning: Study several specimens, to be sure the one you use is typical, but make all your drawings from the same specimen. I once finished a model before I discovered that I had used the feet of one species and the wings of another! To assure durability the model is built over an armature, or rigid framework, a little smaller than the finished product. Each leg and other appendage is supported by a soft iron wire, as thick as its dimensions-will allow, which is bent at the places where the joints will be-so as to assure a lifelike posture. These are attached to a core of balsa wood roughly conforming to the shape of the body. II the model must stand free upon its own feet, it is wise to treat it as a unit, securing the legs immovably from the beginning. It is much easier to handle the elements separately, but this requires a supplementary prop. The actual modelling material is wax, the compounding of which is somewhat experimental, and therefore fun. As a precaution against fire, it should be done in a double boiler such as cooks use in making custard. The basic ingredient is purified bees’ wax, an almost colorless translucent substance, tough, and, at summer temperatures, a little tacky. It may be hardened by the addition of a little high-melting paraffin, but too much of this will make the mixture brittle. Whiting or talcum powder renders it opaque. Fine cotton fibers lend it strength and bulk, but for most purposes plain bees’ wax will do. Even this, however, is usually tinted the ground color of the subject. Oil paints or dry pigments may be used with equal success if the color be first spread upon a glass plate and there mixed with a spoonful of hot wax vigorously stirred as it is setting. This vivid mixture, added bit by bit to the molten contents of the pot, will produce an even hue without the risk of over-coloring. An ample quantity of wax should be prepared in the beginning, for it would be difficult to match it later. The liquid wax, hot and homogeneous, is applied to the armature with a paint brush. Each layer is allowed to cool before the next is added. Thus the model is built up, like a pearl or an onion, until it is a little bigger all over] than it should be when finished. For this process 1 keep three long-bristled brushes. One, an inch and a half wide, is for laying a heavy coating over a large surface. A half-incher serves in smaller places, and a very little one is reserved to touch up errors as the working-down progresses. Working-down begins when the wax is cold enough to handle without distortion. It is not, strictly speaking, modelling at all. it is, rather, a kind of carving, for the wax is cut and scraped into shape, with whatever tools lie readiest to hand. 1 fancy an old scalpel and a sculptor’s plaster-scraper, but a pen-knife and grapefruit corer would do equally well. Broad-bladed dissecting needles are wonderfully handy for the liner detail, though perfectly satisfactory tools may be beaten out of nails, and filed to shape for their particular purposes^ Wax feels, in the carving, somewhat like soap, but is less brittle, and easier to mend in case of accident. When every part of the model can be checked, with dividers, against the original drawings, and match at every point, the worst is over. If the work has been done in pieces, these may now be assembled, and the trimmings added. Large clear wings have hitherto, been made of celluloid. Nowadays, I suspect, a less inflammable acetate type plastic would be used. Flat scales with narrow bases such as clothe mosquito models have sheet-plastic foundations Spines and coarse hairs are made of wires, tapered by dipping them in acid. 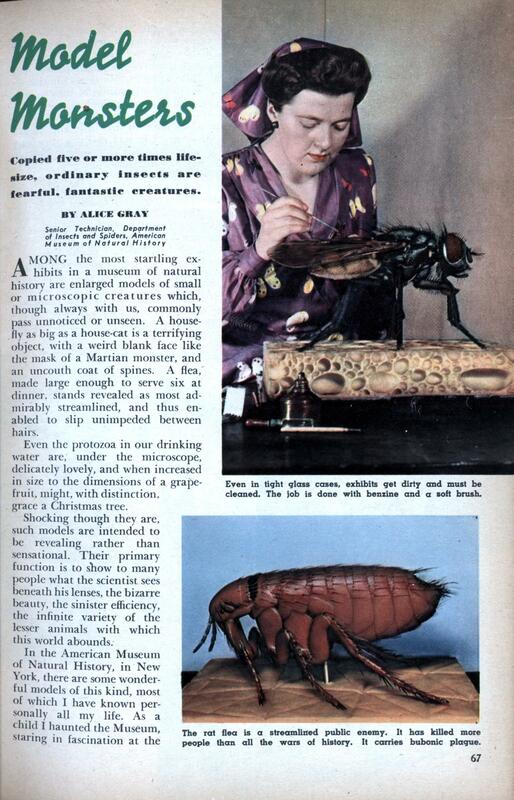 I remember yet the thrill with which I discovered that the compound eyes of the housefly model were composed of tiny red glass beads, loom-threaded like an old-fashioned reticule. Tool marks can be removed from the completed model by brushing the surface with a fine soft – brush dipped in a solvent such as xylol or turpentine. When this has quite evaporated and the surface is again hard, it is given a light coat of shellac. Were it not for this, the oil paint used in coloring the model would dissolve the wax and produce a gummy mixture that would practically never dry. But when the paint itself has set, which takes several clays, its glossy surface may be dulled by a thin coat of wax and turpentine without danger of such catastrophe. Such is the substance of one system of making models of miniature monsters. It is by no means the only method, but it is a good one, and capable of endless variation. For instance: the Dahlgren models in Darwin Hall owe their wonderful transparency to a prodigal use of glass. This was blown to specification by a superlative craftsman, Herman Mueller, whose all-glass models of protozoa and other lowly creatures may be seen in neighboring cases. All this may sound like quite a lot of work; and so it is. What of it? Model makers are a curious tribe who work less for money than for love. The more challenging a problem is, the better they like it. Even were this not so, the pains would be justified by the results. A well-made model is both a . text and a treasure, and if treated with respect should last indefinitely. 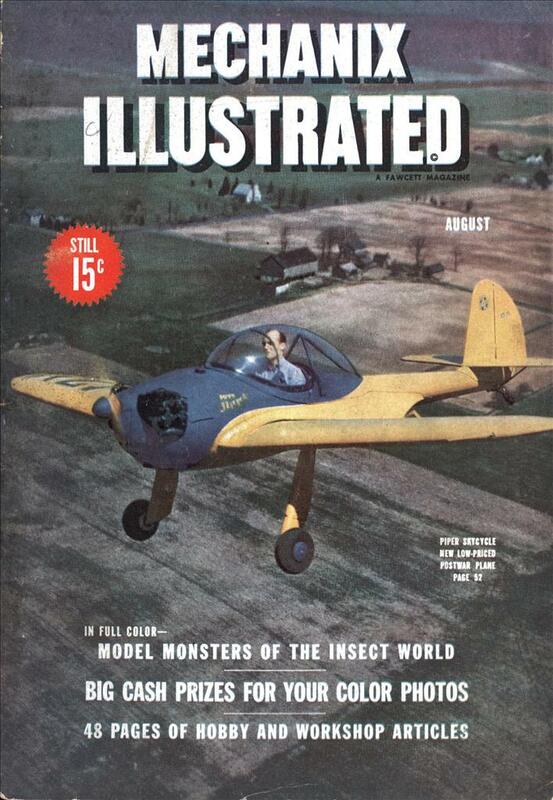 Ignaz Matausch, who made most of the big models in the Insect Hall, died, so they tell me, thirty years ago. His five little tree-hoppers, made, I am sure, just to show how whimsical insects can look, might have been finished yesterday. A hundred years hence his Yellow Fever Mosquito may still be the same sophisticated vampire that has already borne unruffled the prying eyes of at least two generations. Of the hundreds of people who daily pass these models in the Museum, many never even see them. Others take one glance, gulp, and run; or stare right at the label reading “ENLARGED MODEL” in half-inch letters, casually exclaim “What a size!” and let it go at that. But there are some visitors who look, see, and remember, and it is for them that all museum modelling is done.